Introduction. Dobutamine stress test (DST) is used as a method of functional cardiac examination in human medicine due to dobutamine’s effect, which is similar to moderate physical exercise. 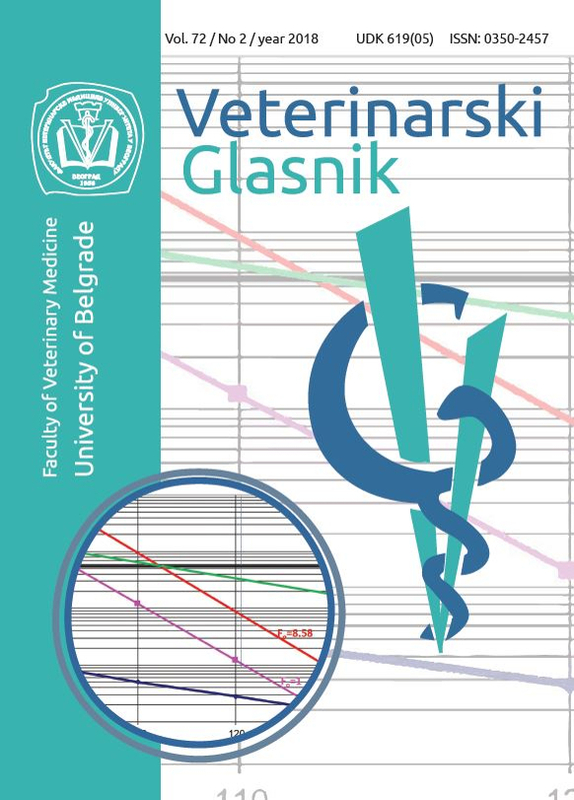 The aim of this study was to assess the feasibility and echocardiographic characteristics of a conventional DST in dogs. Materials and Methods. Ten clinically healthy German Shepherd dogs were submitted to a conventional 3-minute stage DST protocol (the initial dose 7.5 μg/kg/min was increased at 3-minute intervals by 5 μg/kg/min until a maximum dosage of 42.5 μg/kg/ min; the maximum DST duration was 24 minutes), which is used in human medicine. Dobutamine action was monitored by noninvasive diagnostic methods (simultaneously lead II electrocardiography and transthoracic echocardiography). Left ventricular echocardiographic parameters were measured at baseline and at the peak of DST. Results and Conclusions. The duration of conventional DST in dogs was 19.4±4.06 minutes. During the DST, sinus tachycardia was registered with no abnormalities of cardiac rhythm. The adverse effects registered in this study were excitement, panting and weakness. Interventricular septum thickness in systole (P=0.0093) and diastole (P=0.0080) increased significantly at the peak of DST. The left ventricular endsystolic dimension (P=0.0077) and the diastolic wall stress index (P=0.0125) decreased significantly at the peak of DST. A 3-minute stage with increased doses of dobutamine is a feasible method for the DST in dogs. The registered changes could be explained by the dobutamine effects through β1 adrenergic receptors. This pharmacological stress test induces significant changes in left ventricular echocardiographic parameters in healthy adult dogs. Dogs exhibit transient signs like sinus tachycardia, excitement, panting and weakness during DST. Additional research on DST should evaluate the diagnostic value of this protocol in dogs suffering from cardiac disease. Aurigemma, G.P., Gaasch, W.H. 2007. Quantitative evaluation of left ventricular structure, wall stress and systolic function. In The practice of clinical echocardiography. Ed. Otto, C.M. Saunders Philadelphia, pp. 187. Liang, C., Yi, J.M., Sherman, L.G., Black, J., Gavras, H., Hood, W.B. 1981. Dobutamine infusion in conscious dogs with and without acute myocardial infarction: Effects on systemic hemodynamics, myocardial blood flow, and infarct size. Circulation Research, 49:170-180. Lima, R.deS.L., DeLorenzo, A., Issa, A. 2008. Reduced adverse effects with an accelerated dobutamine stress protcol compared wiith the conventional protocol: a prospective, randomiyed, myocardial perfusion scintigraphy study. International Journal of Cardiovascular Imaging, 24:55-59. Mertes, H., Sawada, S.G., Ryan, T., Segar, D.S., Kovacs, R., Folty, J., Feigenbaum, H. 1993. Symptoms, adverse effects and complications associated with dobutamine stress echocardiography. Experience in 1118 patients. Circulation, 88:15-19. Minors, S.L., O’Grady, M.R. 1998. Resting and dobutamine stress echocardiography factors associated with the development of occult dilated cardiomyopathy in healthy Doberman Pincher dogs. Journal of Veterinary Internal Medicine, 12:369-380. Sousa, M.G., Pereira-Neto, G.B., Carareto, R., Gerardi, D.G., Camacho, A.A. 2005 Assessment of eletrocardiographic parameters in healthy dogs undergoing dobutamine stress testing. Schweizer Archive Fur Tierheilkunde, 147:541-545. https://doi.org/10.1024/0036- 7281.147.12.541. Wackers, F.J.T. 1993. Which pharmacological stress is optimal, Editorial comment. Circulation, 87:646-648.